Useful Model Railroad Wiring Tips. This is a circuit that Gord Baverstock uses on his Owen Sound HO-scale DC layout. Bill Payne of our Nottawasaga Model Railroad Club helped me test the circuit on my workbench to make sure I had done the drawing correctly. This is designed for a DC layout, not DCC. Try the circuit on your workbench with any DC Powerpack, a DC-powered locomotive, a length of rail, and some alligator clips. If you don't have any 1.5 volt bulbs, hook up a multimeter instead of the bulb and read the voltage as you apply power. When power is applied the needle will move to 1.2 volts approximately. This is also a good way to test the circuit without blowing the bulbs if you hook it up wrong. Basically, the bulb is in series from the DC Powerpack to one rail through the bridge rectifier. The wire to the other rail isn't involved. It doesn't matter which rail you choose as long as you are consistent block to block. I've shown the circuit for one block. You would repeat the setup for adjacent blocks. When a locomotive is in the block and drawing power the bulb will light. The bulb will turn off when the locomotive leaves the block. You can duplicate this by lifting the locomotive off the test track. This only works with 1.5 volt microbulbs. The resistance of the bulbs could be important. One of the bulbs I tried was brighter than another one. Gord had given me a couple of bridge rectifiers to play with. He buys them from an electrical surplus store. You could also try one from RadioShack or an electronics store. I don't think the specs are critical. If you are unfamiliar with bridge rectifiers, the little wavy lines denote alternating current (AC) and the + and - are marked. Note that you install a jumper between the + and - terminals on the bridge rectifier. Gord also installs 1.5 volt bulbs in his control panel. If you want to do this you would power them in parallel with the bulb, not in series. If you like this simple circuit you only need to build the signals. You could adapt the kits from Oregon Rail Supply to take microbulbs instead of LEDs or use their dwarf assemblies. Model Railroader magazines ran an article in March, 2007 titled "Build your own signals" by Peter Pemberton. It was available for free download and may still be available from www.trains.com/mrr. The article explains how to make signals using the Oregon Rail Supply signal heads as a starting point. Here is a variation on the same model railroad wiring circuit that comes from an old issue of the NMRA Bulletin and originally appeared in the Sunshine Division'sJ ournal Box newsletter. The bridge rectifier is made from four diodes and is connected on one side to the Powerpack and on the other side to one of the rails. In this case full DC track power can be delivered to the bridge. The bulbs the author used were either No. 48 or 49, one being a screw base and the other a bayonet base. They were installed in the control panel. The author noted that he installed a 200 ohm 1 watt resistor across the open terminals of his rheostats to provide energy to the bulbs in order to indicate train occupancy when the power is off. This did not supply enough power to make engines with can motors start but did light the bulbs. I tried this circuit at my workbench using a Tech II 1500 DC Powerpack and four diodes wired according to the diagram below. I hooked up a multimeter on the 10 Volt DC scale to see what voltage I would get and then connected a 1.5 volt grain of wheat bulb when I knew the voltage was in the correct range. The bulb glowed as I turned on the power and the motor in a DC-powered locomotive began to turn. I didn't try the 200 ohm 2-watt resistor idea so I pass this information on with the caveat that I haven't tried that so you're on your own. I would try it on the workbench with a test track first. I decided to go an extra step to see what would happen on DCC. I set up a separate test track that was isolated from the rest of the layout. Then I clipped on the leads from the bridge rectifier that I had hooked up using an ACE circuit evaluator. 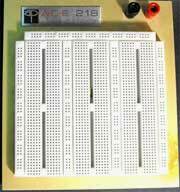 (This is simply a pegboard where you can plug wire leads into a bunch of holes to make a circuit without having to solder anything). Then I put a DCC decoder-equipped locomotive on the test track. The 1.5 volt bulb glows faintly as soon as I attached the leads to the test track. As I advanced the throttle to the top speed step the bulb glowed much brighter. If you can tolerate the bulb glowing faintly at all times you can get away with using this circuit on DCC. It is an inexpensive solution because diodes are cheap. There are better solutions from companies like LogicRail and Dallee Electronics for DCC but they cost more. Incidentally, I drew these diagrams with CADRail software. The program is not limited to drawing trackplans. It contains a folder with electrical symbols. CADRail works with layers so that you can use different colors for various purposes such as room dimensions, benchwork, track, wiring, scenery or whatever you want. DCC really needs a heavier bus wire to minimize loss. I use AWG 10 for my main bus power. It may be overkill but it works for me. Sizes 22 to 25 are OK for short runs, lighting circuits and powering relays. As I keep relays for frog power fairly close to the actual turnouts they control I can get away with size 22 or "telephone wire" to route power to the frog from the bus or track. Small flexible wire is better in rolling stock. I keep a roll of magnet wire, the kind that's used for the coils in twin selenoid switch machines or in motors, for use in rolling stock and rewiring locomotives. It is necessary to scrape off the enamel coating before using it. I also keep the bits of small wire that's left over when installing DCC decoders for special purposes. Other wire that comes in handy is two-wire polarized speaker wire that is often 24-gauge. Multiple strand cables are best for jobs like Digitrax Loconet or Lenz Xbus to carry the signals to the decoders from the command stations. Digitrax uses a 6-wire telephone plug cable and the Lenz Xbus uses five wires. The manuals for the various systems explain how to wire the railroad. If it calls for a twisted cable be sure to do so to avoid cross talk interference between the wires. I must admit that my wiring has gotten messy because I haven't kept wiring separate for different functions such as track power from turnout power and lighting circuits. I use what wire I have on hand and splice when necessary. My good intentions for maintaining a color code got lost somewhere along the way and I misplaced the book I started keeping notes in. All the more reason to mark and code the wires wherever they terminate. There's nothing worse than crawling on your back under the layout trying to retrace a wire to find a problem. Another good idea is to break the railroad into some electrical sections so you can isolate an area to track down a problem. One thing I've had trouble with when using 2" styrofoam is sticking a wire through it. I usually used a piece of rail or a scriber to make the hole but there was always a burr that interfered with pushing the wire through. Gord of SLN Hobbies in Port Dover has a solution: thread the end of a stripped 22 gauge wire through the eye in a knitting needle, insert the needle into the styrofoam top and simply pull it and the attached wire through to the bottom. He says a sailmaker's needle will also work if you happen to patch your own sails! Another suggestion is to coat a knitting needle with rubbing alcohol to make it slide easier. Trailer hitch plugs are a handy way to hook up Powerpacks, interconnect modules, and power blocks. We use them extensively on our modular club layout. We mainly use the four-prong cables. Cut them in half and use the offset connector for the common. All four wires are color-coded so it's easy to keep things organized. Some modelers use suitcase connectors that pinch into a wire. You need to buy the correct size for the wires you are connecting. I still use screw-type terminal strips. When I don't have spade lugs on hand I resort to putting some solder on the end of stranded wire and bending it into a "J" shape to install onto the terminal. When using multiple connector wire, stagger the splices to help avoid short circuits and keep the wires visually separated. Use heat shrink tubing, electrical tape or liquid electrical tape. You can find it in the automotive department. It's a little messy but can be very useful. Be careful when applying it because it takes time to harden. It will drip. I use a toothpick to apply it instead of the big brush that comes with it. Don't leave the can open or the air will dry it out. You can buy stick-on letters and numbers that wrap around wires. Another method is to use adhesive tape or masking tape and a black marker pen. Cut rectangles of white cardboard or paper an inch or so larger than terminal strips and install them behind the strips so you can write information on them as you hook up wires. (If you're really organized you can keep a book but I prefer to have the information right at the terminal strips). An important consideration is to provide some means of making sure you turn the power off to everything (including the soldering iron) when you're finished for the day or night. I have some hobos around a fire pit placed in the scenery where they can be readily seen when leaving the layout room. If the fire is still lit and the hobos are eating beans I know the power is still on. It is also practical to hook up a 24-volt lamp to the AC terminals on your Powerpack and put the lamp where it is easily seen on exiting the room. Another approach is to use a light switch with a neon bulb on the house circuit you're powering the layout from, use power bars with indicator lights or set it up so you have to pull the plug from the wall. Make sure everything is off. You don't want a fire to start accidently. If you're ready to learn more and try some circuit wiring for yourself, you might like to check out this site. Part 1 of the program is a free, downloadable tutorial so you can try before you buy. Click here for Twisted Pair Electronics. 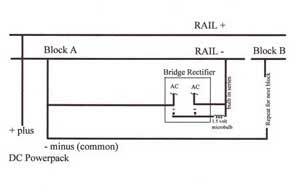 Go to simple Train Detector circuit using a photocell. Go to occupancy signal circuits. Go from model-railroad-wiring to track occupancy using CTs and other wiring considerations..
Go to cheap dwarf signal imitation. Go from "model-railroad-wiring" to locomotive motor installations. Go from "model-railroad-wiring" to locomotive remotoring tips. Go from "model-railroad-wiring" to HO diesel rewiring for all wheel pickup. Return from "model-railroad-wiring" to my Home Page.